Clothes have a shorter lifespan nowadays than they used to. We have to go shopping more often than previous generations did. One of the reasons is our culture. We get bored more easily and there is always something new and desirable to buy. The other reason is strictly practical: clothes get worn out or accidents happen and all of a sudden it is time to go get a new shirt, because the old one now has either a tear, or an irreversible stain. In a way this is nice, because we are in a good situation to experiment, buy beautiful new clothes and change our style as fashion changes around us, or our fashion sense evolves. But sometimes we can’t throw our clothes away, because they are too precious to us. Sometimes they are brand new but suffered an accidental tear, and or we are so used to them we just can’t let go. There is a useful tool, which is designed to help you fix clothes quickly in your home, and it is in a small box. FIXRIP is a collection of patches of different colors and sizes. The creators say they are made of advanced materials, which are also used in the clothes industry. Its creators ship it as a ‘repair kit’ and the visual is a bit like a car repair kit in the sense that it is in a smart box, of course much tinier than the one you would use in case your vehicle breaks. To use FIXRIP open the box and look inside. There are two main sets of patches: for the inside and for the outside of the cloth. You may use the first batch for tears on the inner side and the second – for outside damage and stains that won’t come off. To apply the patch you need less than a minute, scissors and a hot iron. 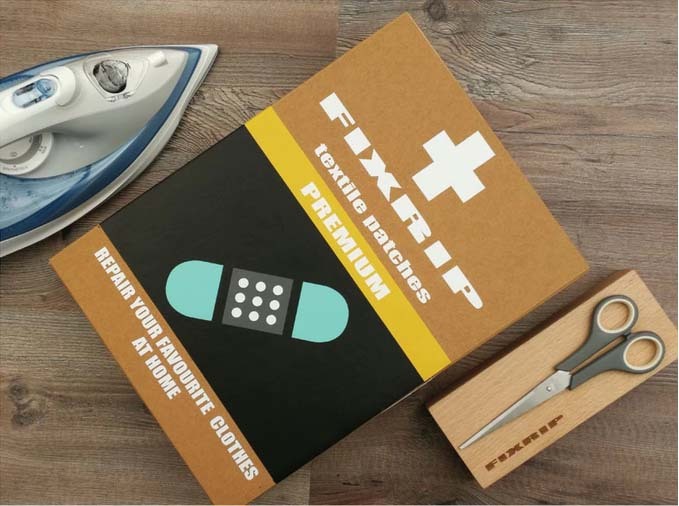 The tool helps repair clothes, such as t-shirts and trousers, but is also good with stronger fabrics like the ones in jackets or backpacks, virtually all clothes and some useful accessories, which may get damaged on the go. FIXRIP is announced as a long-term solution, so you can continue your hike the next day and they won’t break, and you can keep wearing them without any further repair. All you need is the iron at your hotel. And fixing your clothes won’t even spoil your evening: the FIXRIP solution only takes one minute. The startup, which produces FIXRIP, offers a set of patches named Fun patches. They are designed for the outside of the cloth and have different fun shapes, such as animals in all colors. That way the patches won’t only fix your clothes, but add an element of glamour as a personal statement. The fun patches are especially useful for kids’ clothes, because they tear apart more easily and children will surely see the added value of the colorful fun patches. Kids will be quick to show their new shiny application on the sweater they had just yesterday torn while playing with their friends. Apart from not having to throw away your favorite pieces of clothing, there is also the added benefit of being environmentally friendly. Just think of all the damage a new cloth causes to it, from producing the fabric and sewing the cloth, to transporting it all the way to your nearest store. Keeping old clothes is good for the environment and your pocket. FIXRIP is a cool new tool to make your life easier. It will let you wear clothes you like for longer, which is great news for you, your pocket and the environment. And it all comes in a smart little box, which is useful to carry. The guys behind the FIXRIP are running a Kickstarter campaign where you can get more details, order the FIXRIP and support their project!